Scanner Pro is a very handy scanner app that makes life easy. With this neat app, you don’t need that $100 scanner anymore. 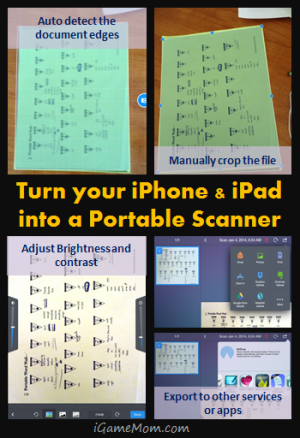 Scanner Pro turns your iPhone and iPad into a scanner. The app is usually $6.99. It is free for limited time. Make sure download the app while it is free, although I think it totally worth it even with the full price of $6.99. The app is very easy to use. You can scan a document like you are taking a picture. The image will be turned into a PDF file. You can take pictures of any document without the app, but the picture usually is in weird shape or with the tinted color you don’t like. Scanner Pro can automatically detect the edges of the document and can take the lighting effect off the image, so you get clean document file. The app also gives you the option to crop the image, so you can edit out certain part of the image that you don’t need, and only the part of the document you want be scanned into the new document. It is very easy to crop the document. Just drag the blue dots at the corners of the document to the position you’d like and then scan. You can scan the document by taking a picture, or if you already have a document in your device’s camera roll, you can select an existing picture. I find it a nice tool to crop some old photos you have. Before you save the scanned document, you have the option to adjust the brightness and contrast level to make the document clearer. Once you are satisfied with the image quality, you can save it on your device camera roll, email it, or export it to Dropbox, Google Drive or Evernote. You can also open it in other apps, such as Skitch, Doceri, QuickOffice, iBook, Kindle. One thing I am very happy to see is that I can open the document in GoodNote. This is the app I use a lot for my son’s printables. With GoodNote, you can write on PDF and imgae file directly. So if you scan a printable with Scanner Pro, open it in GoodNote, your child can use the printable right on your iPAD. You don’t even need print it out. For instructions, please read How to use GoodNote to Write on PDF and Image Files on your iPAD. I did a little experiment while I was writing the review. The app also take pictures off my computer screen. How neat! Scanner Pro is a very useful app for keeping documents, such as printables, receipts. It turns your iPhone or iPad into a portable scanner. It works on iPhone, iPod and iPad. It is usually $6.99. It is free for limited time. I love this app! It’s perfect for times when you need to make a copy of something but don’t have the means – just scan it with your phone and you’ve got it for later! Or if you need to send someone a copy of something quickly, you can snap a scan and email it instantly. Super app! I can’t tell you how happy I am with this app on my phone. Like you said, it is very handy to have. Thank you! Downloading it now and sharing. Glad you got it and thanks for sharing!